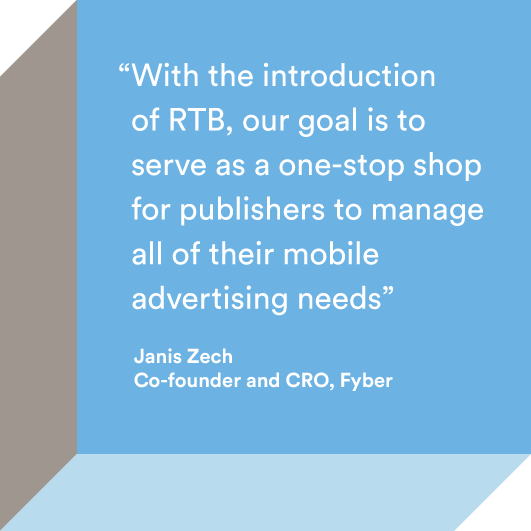 We’re excited to announce the open beta of Fyber’s Real Time Bidding (RTB) platform. Through RTB – a programmatic technology – Demand Side Platforms (DSPs) and their advertisers can bid on app developers’ RTB inventory in real time and apply fine-tuned targeting on the inventory most relevant to them. With this launch, Fyber now brings together a mediation layer across Interstitials and Rewarded Video with an RTB exchange. For DSPs, Fyber’s OpenRTB exchange enables access to a growing base of unique mobile inventory through Fyber’s mobile Supply Side Platform, with 100% in-app placements from premium developers. Through high-performance ad formats – including Opt-in Video and Interstitials – DSPs and their advertisers can reach the segments that matter most from Fyber’s 150M+ monthly unique users and adjust their campaign budgets in real time to respond to performance. DSPs already integrated into Fyber’s RTB platform include TradeMob, Mars Media Group, Ajillion, Pocket Math, Remerge and Liquid M.
For developers, the launch of Fyber’s RTB Exchange means instant access to more high-quality Interstitial – and soon, Rewarded Video – demand, from leading DSPs with larger budgets. Programmatic demand competes against developers’ other demand sources, including mediation, to ensure that the highest-paying ad is always served first. Ready to take advantage of the power of programmatic? To join our OpenRTB beta as an advertiser, please contact [email protected]. If you’re a developer interested in opening your inventory to Fyber’s Programmatic Exchange, please contact your Account Manager. To read the full press release about Fyber’s RTB Exchange, click here.